Even as Iran presidential candidate and presumed frontrunner Saeed Jalili has flaunted his anti-US hardliner credentials on the campaign trail, it’s worth noting a less remarked-upon aspect of his professional resume. 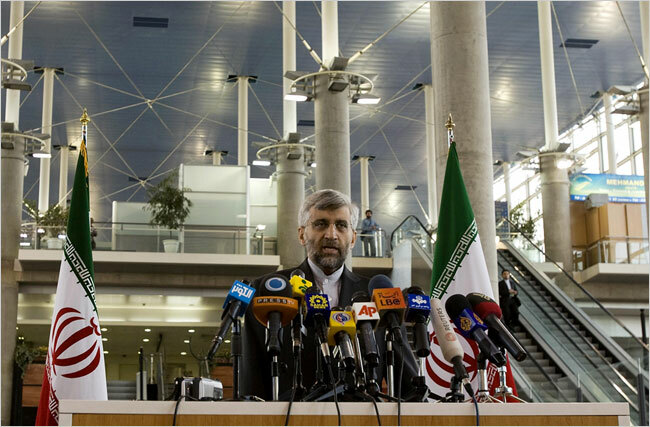 In October 2009, Jalili became one of the only Iranian officials to meet one-on-one with a US diplomat in three decades. The meeting, with then Under Secretary of State William Burns, now the US Deputy Secretary of State, took place October 1, 2009, at a villa outside Geneva, on the sidelines of Iran nuclear negotiations with six world powers. Lead US negotiator Burns and Iran’s Jalili held a “one-on-one sidebar conversation,” a White House spokesman confirmed at the time. “The sidebar occurred at the Villa”–Villa Le Saugy, in the Swiss countryside village of Genthod–during a lunch break in the nuclear talks with the so-called P5+1. Iran and six world powers announced tentative agreement at the Geneva meeting on a nuclear fuel swap deal that would provide fuel for the Tehran Research Reactor in exchange for shipping out most of Iran’s stockpile of 3.5% enriched uranium; but the deal later broke down at follow up technical talks in Vienna. Iran also agreed at the Geneva talks to let IAEA inspectors visit the secret Fordo enrichment facility at Qom, whose discovery the leaders of the United States, UK and France had jointly announced just days before, at a G-20 summit in Pittsburgh. “Iran is on notice that when we meet with them on Oct. 1 they are going to have to come clean and they will have to make a choice,” President Barack Obama, flanked by French President Nicolas Sarkozy and UK Prime Minister Gordon Brown, said September 25, 2009. In retrospect, it seems plausible that the Iranians agreed to the sit-down with the Americans in Geneva as a tactical gesture, out of concern over the western reaction to the discovery of the Qom enrichment facility, which Iran only hastily declared to the IAEA after it realized it had been discovered. But one Iranian source, speaking not for attribution, said the political decision in Tehran to hold the bilateral meeting with the Americans had already been taken. “Iranian press gave considerable coverage to the bilateral meeting between [Under Secretary] Burns and Jalili,” another October 4, 2009 US diplomatic cable, sent from the U.S.'s Iran regional presence office in Dubai, noted. “While little coverage went beyond the Department's announcement that the meeting had taken place, Tabnak noted that unlike Iran's previous discussions on the nuclear issue, this time it was face-to-face with the US.” Another Iranian paper described the meeting as “unprecedented,” the US diplomatic cable continued. Jalili’s deputy, Ali Bagheri–who has lately been accompanying Jalili on the campaign trail–acknowledged the Jalili-Burns sidebar meeting in an interview with Iran’s state television at the time, but stressed the meeting occurred only at the Americans’ insistence. Iran has disqualified former Iranian president Akbar Hashemi Rafsanjani and Ahmadinejad ally Esfandiar Rahim Meshaei from running in next month’s presidential elections, Iran’s state news television channel reported Tuesday, according to the BBC. Iran’s Guardian Council has approved 8 candidates to run in next month’s polls, including top Iran nuclear negotiator Saeed Jalili–widely seen as the regime's anointed front runner–and former Iranian foreign minister Ali Akbar Velayati, the BBC report said. Other approved candidates, according to Fars News and reports on Twitter citing Iran State TV said, are: former Iran parliamentarian Gholam-Ali Haddad Adel–(whose daughter is married to the Supreme Leader's son Mojtaba); Tehran mayor Mohammad Qalibaf, former IRGC commander Mohsen Rezai, former Iran nuclear negotiator Hassan Rowhani–a Rafsanjani ally who serves as the Supreme Leader's representative to the Iran National Security Council; former Iranian vice president Mohammad-Reza Aref and former Iran telecommunications minister Mohammad Gharazi. “The most important lesson of 2009 was that prevention is better than cure… better eliminating Rafsanjani and Mashaei now, than dealing with them later down the road,” Ali Vaez, Iran analyst at the International Crisis Group, said Tuesday, referring to the Iranin regime's view of the violent unrest that followed disputed June 2009 presidential elections results, which opposition green candidates and many of their supporters believed were stolen. Iranian authorities appear to have engineered a slow roll out of the decision–while severely curtailing Internet service over the past week–in order to discourage unrest from supporters of candidates who have been shut out. The Guardian Council, whose spokesman hinted Monday that Rafsanjani would be disqualified over his age (78), reportedly informed Iran’s Ministry of Interior Tuesday of its decision, and the Interior Ministry is slated to publicly announce the approved slate on Wednesday. Some Iranian analysts speculated earlier this week that the Supreme Leader Ayatollah Khamenei might contemplate whether to step in and reinstate Rafsanjani’s candidacy in order to try to build legitimacy for the poll and increase voter turnout, but there were no signs yet on Tuesday whether he had any such intention. The restricted slate of approved candidates, however, “definitely will exacerbate the fissures within the ruling elites,” he continued. The presidential campaign of Iran’s top nuclear negotiator Saeed Jalili has thrust Iran’s nuclear policies to the center of Iran’s tumultuous presidential race. “Our nuclear objective is very legitimate & reasonable: To accelerate developing the peaceful Nuclear program,” Jalili’s official campaign Twitter feed wrote Friday. Jalili’s message seems notably targeted to one key audience at this point: Iran’s Supreme Leader Ayatollah Khamenei, Iran watchers observed. Jalili’s message of “resistance–political resistance, economic resistance–that feeds the narrative of the Supreme Leader,” said Iran political analyst Yasmin Alem, in an interview Thursday. It may resonate less, however, she added, with the average Iranian voter. “The fact that [the Jalili campaign writes] it in English is the point: he will be the president who will say this to the westerners,” Parsi added. “Most of the main candidates”—Tehran mayor Mohammad Qalibaf, former foreign minister and foreign policy advisor to the Supreme Leader Ali Akbar Velayati, former Majles speaker Haddad Adel, and Jalili—“are campaigning not for the Iranian electorate’s votes, but for the approval of Ayatollah Khamenei and the Revolutionary Guards,” Alireza Nader, an Iran analyst at the Rand Corporation, observed Friday. In his opinion, he said, that portends that June 14th will mark “the least democratic election” since Iran’s 1979 Islamic revolution. Four days after entering Iran’s presidential race, Iran’s top nuclear negotiator Saeed Jalili met with European Union foreign policy chief Catherine Ashton in Istanbul on Wednesday. The negotiators’ meeting comes as six world powers have more or less put Iran nuclear diplomacy on hold while Iran’s presidential campaign, scheduled for June 14th, plays out. Jalili’s entrance into Iran’s presidential race highlights some of the complications western negotiators confront in securing a nuclear deal with the Islamic Republic. While Iran’s nuclear file–as lead US negotiator Under Secretary of State Wendy Sherman told a Senate panel Wednesday– is controlled by Iran’s Supreme Leader Ayatollah Khamenei, not the Iranian president, the deep fissures that have roiled the Iranian regime under the polarizing Ahmadinejad presidency have greatly complicated international negotiators’ task by making internal Iran consensus that much harder for Tehran to achieve. Jalili, 47, a trusted Khamenei aide who has served since 2007 as the secretary of Iran’s Supreme National Security Council (SNSC) — the Iranian equivalent of National Security Advisor–has managed to largely bypass the bitter feuds that have polarized Iran’s ruling factions, analysts and associates observe. As a candidate who may be able to unite key conservative factions, a Jalili presidency potentially offers the prospect of a more consolidated Iranian leadership, which might be able to muster internal Iranian consensus if the Leader decides to make a deal, some analysts suggest. But Jalili’s elliptical negotiating style and somewhat retro worldview, while no doubt reflecting the milieu and instructions given from the Supreme Leader, also magnify the extreme difficulty of negotiating with an Iranian regime that is so isolated from and mistrustful of the outside world. Current and former Iranian associates describe Jalili as a pious and intelligent man, who has earned the trust of the Supreme Leader, but shown a disinclination to deeply engage with the modern world. Born in 1965 in the Iranian holy city of Mashhad, where Supreme Leader Khamenei is also from, Jalili is an Iran-Iraq war vet who joined Iran’s foreign ministry around 1990. (Earning his PhD from Iran’s Imam Sadeqh University, Jalili wrote his doctoral dissertation on the prophet Mohammad’s diplomacy.) He worked in the 1990s as an official in Iran’s foreign ministry, and then in 2001 joined the Supreme Leader’s office. In 2005, he became an advisor to new Iranian president Mahmoud Ahmadinejad. Since 2007 he has served as the Iranian equivalent of National Security Advisor and Iran’s chief nuclear negotiator. But part of Jalili’s appeal for Khamenei and the clerical circles is a kind of self-selecting isolationism and retro way of looking at the world, that seems somewhat stuck in the 1980s, when Iran fought an eight year war with Iraq, the Iranian analyst observed. Though Jalili served for over a decade in Iran’s foreign ministry, he never served abroad, and allegedly turned down an offer to serve in Latin America, the associate said. And while Jalili worked for a time in the Foreign Ministry’s Americas’ bureau, he is not believed to be able to speak much English, the lingua franca of international diplomacy which is spoken by many Iranian diplomats, though his associate said he believes Jalili can read and understand it. repeatedly emphasised during the campaign that Israel risked being isolated internationally absent a more credible peace effort. Israel’s rightward drift, then, can be stemmed and even reversed if the West sends the right signals through smart pressure and imposing consequences, rather than evading its responsibility in responding to Israeli violations of international law. How the West approaches that responsibility will go some way to determining whether Lapid becomes the presentable face of a government that continues to deny Palestinian rights and defy International law or recognizes the need to challenge existing policies in this respect. The policy choices that the Palestinians take, of course, are not irrelevant to that equation. Diplomats from six world powers, following further unpublicized consultations in recent days, have decided to propose to Iran dates for holding a new round of nuclear talks as early as this month, diplomatic sources told Al-Monitor Monday. However, a meeting is not expected to materialize before January, they said. Diplomats from five of the six nations in the so-called P5+1 also agreed in their latest consultation to “update” the package presented to Iran at a meeting in Baghdad last May, the diplomatic sources said, although they downplayed expectations for major changes to the package. In addition, one country, believed to be Russia, had not yet formally signed on to that decision, one expert briefed by the US administration told Al-Monitor Monday, adding that it was his understanding the dissenting nation wanted a more revamped, generous package. That position is apparently now at odds with the consensus of other members of the international negotiating group, comprised of the United States, United Kingdom, France, Germany, China and Russia. “Dates in December will be proposed, but I doubt a meeting will materialize before January,” one western diplomat, speaking not for attribution, told Al-Monitor Monday. “The package needs a little bit of updating, as things have evolved since the package was defined, but nothing radical is to be expected,” the diplomat added. A spokesperson for European Union foreign policy chief Catherine Ashton, asked by Al-Monitor Monday about the consultations, said that a date for the next round of Iran nuclear negotiations “is still under discussion.” There had been no physical meeting of the P5+1 in recent days, he added. Secretary of State Hillary Clinton, speaking to the Saban Forum of Middle East experts in Washington late last month, alluded to intense consultations on the issue of what the international group should present to Iran at resumed nuclear talks. “We are deeply engaged in consultations right now with our P-5+1 colleagues, looking to put together a presentation for the Iranians at the next meeting that does make it clear we’re running out of time, we’ve got to get serious, here are issues we are willing to discuss with you, but we expect reciprocity,” Clinton told the Saban Forum November 30th. The Obama administration had in recent weeks been debating whether the “stop, shut and ship” package presented to Iran last May should be “refreshed” and possibly broadened to what some in the administration called “more for more.” The “more for more” offer, as one US source explained it to Al-Monitor last month, would envision updating the Baghdad 20% proposal to get more verifiable limits on the rest of Iran’s nuclear program, in exchange for greater international concessions, including some form of sanctions relief. But the diplomatic sources told Al Monitor Monday that the changes to the package were not expected to be large scale. Washington and five world powers are considering offering Iran a refreshed proposal that could include limited sanctions relief in exchange for curbs on its nuclear program, Iran analysts and western diplomats briefed on the consultations said this week. Diplomats rom the P5+1 are expected to hold a new round of talks with Iran next month, following informal contacts this month between European Union foreign policy chief Catherine Ashton, her deputy Helga Schmid, and their Iranian counterparts, the sources said. Given many US sanctions on Iran are legislated by Congress, and not solely under the discretion of the executive branch to lift, Washington will be looking to the Europeans for options for limited sanctions relief, Parsi said. Western diplomats see a few month “window”–from the US presidential elections Nov. 6 until some time in the spring–in which to try to negotiate a deal, Al Monitor‘s Barbara Slavin reported this week. Western diplomats and analysts suggest the timeline may be constrained, both because of wide anticipation of renewed pressure from Israel for military action early in the new year, as well as Iran’s leadership preparing for Iran presidential elections in June.